Vintage Combat planes await action at the Rice Mill Road flying site in Richmond, B.C. for the 2016 Combat Graffiti event. Larry photo. July 9, 2016, Rice Mill Model Airplane Park, Richmond, B.C. 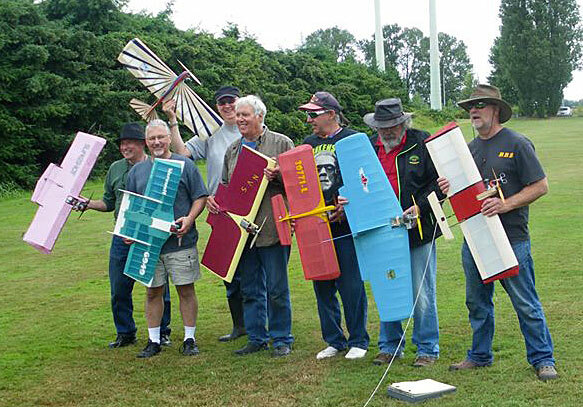 The original and still the greatest antique combat event took place once again in the Vancouver B.C., area at the Richmond flying site. Contest director this year was Adrian Duncan. Barrie Hobkirk was the architect for the rules, and they work perfectly, though a real departure from the norm in combat flying. The whole idea is to be able to build front row quality models of pre-1964 vintage and not have them destroyed by some guy going gonzo on the handle. Some of the models have nearly as much time in the finish as a stunt ship, so protection of the work is of high concern. No kills, only two cuts allowed, and a center marshal to stop the match if it gets out of hand. Each model is judged as though it were a scale event. 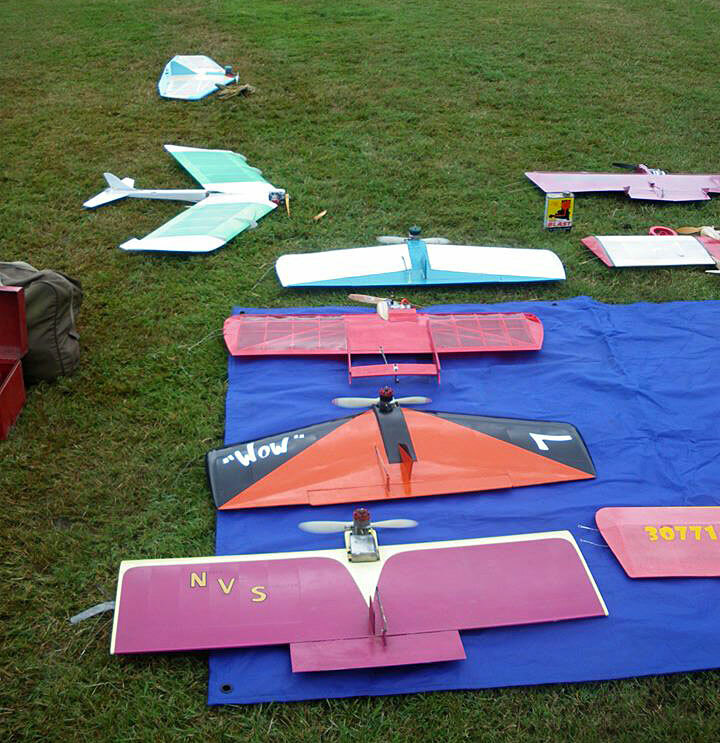 Documentation is a must, showing the year and such things as accurate airfoil, covering materials, as well as original engine and vintage prop. Points are awarded and combined with flying points earned in the matches. This year we relaxed things quite a bit and just had a picnic. Chili was provided to the pilots and graciously prepared by Lorna Duncan, along with the pots and pans and new camping stove. 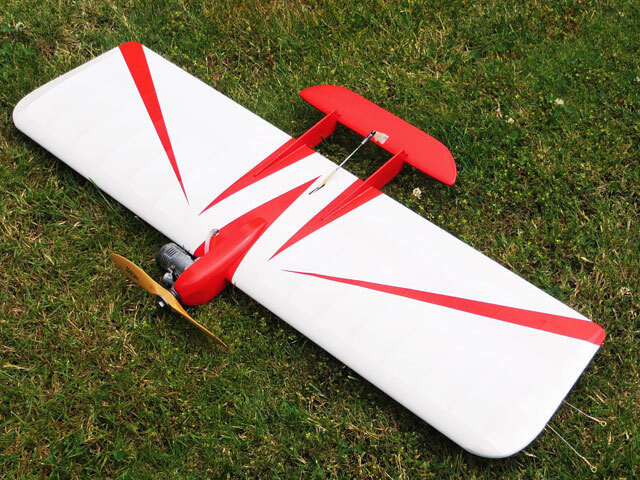 The relaxed atmosphere made it enjoyable but caused long intervals between actual matches flown. Hey -- there's a lot of catching up to do with each other, ya know. It was said to me at the Northwest Regionals this year that Marty Higgs, aka The Hippie, is a myth and really does not exist. Well, I'm here to say that's a false rumor. Marty was there -- no, really! Ken Burdick photo. The creator of C speed, Northwest B proto (the original rules) as well as the Frankenstein series of three-port LA.25 Geezer Speed engines, is seen at left standing with Kenny-b after the action had died down. The Hippie is still making speed parts but only when the inspiration and time is there. He did say he would make a new D tank for the Louie-mobile so look out in D speed! 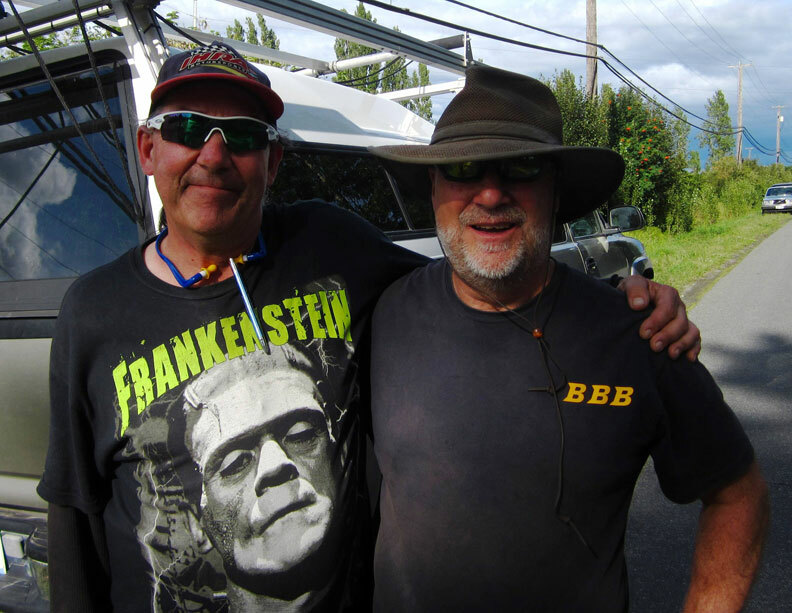 Marty is always willing to help out any newcomer to speed so don't hesitate to contact him. 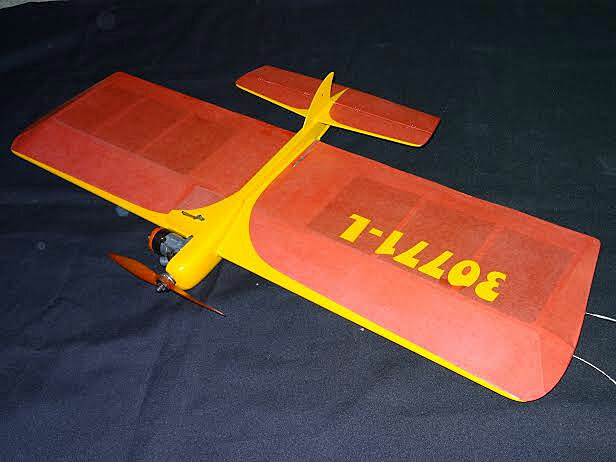 Barrie Hobkirk, who is known for his scale models and speed background, produced a near museum full of combat models ranging from a flawless T-Square, to the Scrapper, Pappy DeBol'ts All American Combateer, to a very obscure and cool Fox Rumble. Me? Oh -- well, this year I attempted silk models and guess what -- they all warped. Not just a little, but a lot! Yep, Kenny-B was seen running from many a silk covered model including the Sweet Sweep. There seemed to be one area in particular, that collected crashes that could NOT be explained -- we began to call it Area 51. I lost three models there! 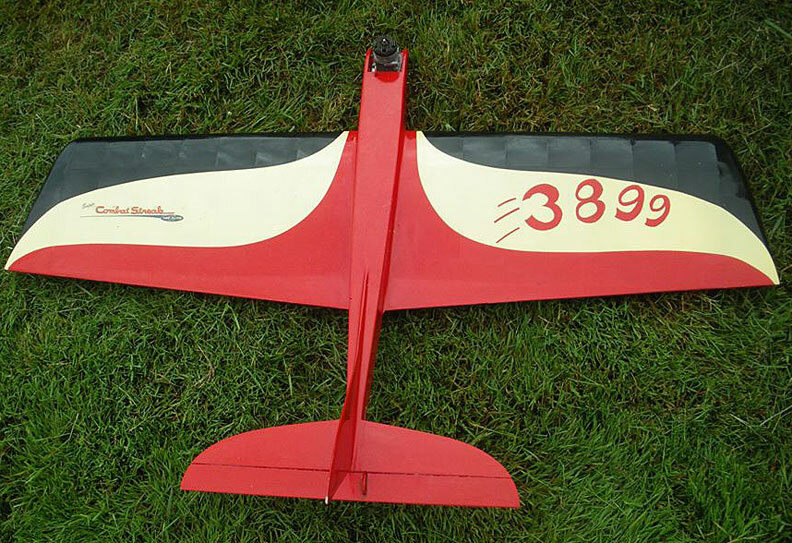 I had a bet with Barrie, that I could get a Jr. Satan (silk covered but unwarped), sporting a Tee-Dee .15 to fly over 70 mph on .018" x 60-foot lines. There were four cans of Dinty-Moore beef stew on the line here. It wasn't until I got home that I discovered the .018 lines were really .021 -- man, that thing chased me from here to there and back! The rest is as they say, history. It was a very fun weekend for us in spite of many models turning left, a fun time was had by all. A heartfelt thanks to all those who participated and helped set up, tear down and run the show. Adrian Duncan, Lorna Duncan, Larry, Chris Cox, Charlie Johnson and his better half.and thanks too to the Vancouver Gas Model Club for their help in making sure things were MAAC approved. If I have forgotten to include your name, please forgive me. 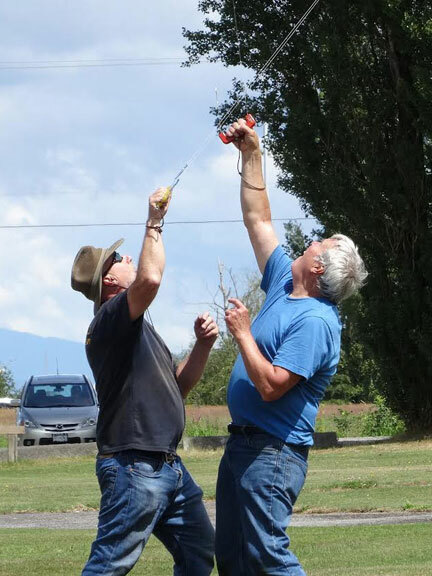 See the Pacific Aeromodellers Club members' write-up on the event on Facebook. Barrie Hobkirk's Combateer. Barry Hobkirk photo. Marty Higgs' Guided Missile. Barry Hobkirk photo. Greg Davis' Super Combat Streak, the winning plane. Barry Hobkirk photo. Barrie Hobkirk's VooDoo. Barry Hobkirk photo. 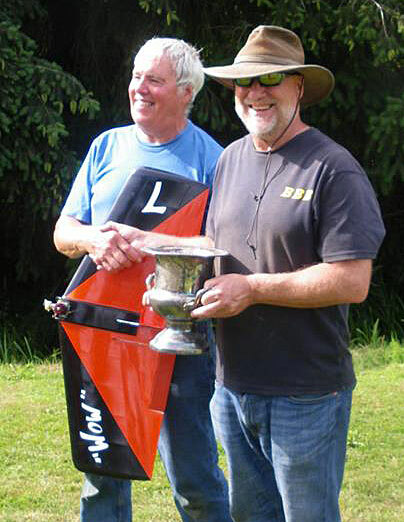 Greg Davis (left) gets the Combat Graffiti trophy from Ken Burdick. Barry Hobkirk photo. All the Combat Graffiti participants. Barry Hobkirk photo.